You have added Beads and Blossoms Crochet Strap Dress in Mint into shopping cart. This light and airy dress is perfect for casual summer days--it has just the right amount of details to make an impression. 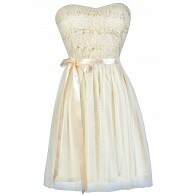 The Beads and Blossoms Crochet Strap Dress is made of a gauzy fabric and is fully lined. 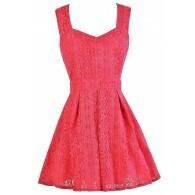 It has a rounded neckline, empire waist, and a flowy cut. Delicate bronze beads decorate the bust of this dress and add a touch of shimmer. The straps of this dress are made of crochet flowers, adding a whimsical touch. An exposed back zipper completes this dress. The Beads and Blossoms Crochet Strap Dress looks nice paired with flat beaded sandals and an oversized bag. You can also dress it up with wedges and delicate jewelry. Details: Lined. Exposed back zipper. 60% cotton, 40% polyester. Lining: 100% polyester. Hand wash cold water separately. Color will bleed. No bleach. Hang to dry. Small measurements: Length from top of bust to hemline: 27". Bust: 32". You have added Beads and Blossoms Crochet Strap Dress in Mint into Wishlist. You have added Beads and Blossoms Crochet Strap Dress in Mint for Stock Notification. 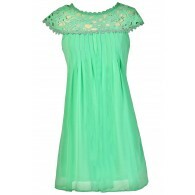 You have set Beads and Blossoms Crochet Strap Dress in Mint as a loved product. You have removed Beads and Blossoms Crochet Strap Dress in Mint as a loved product.